Hey there everybody! 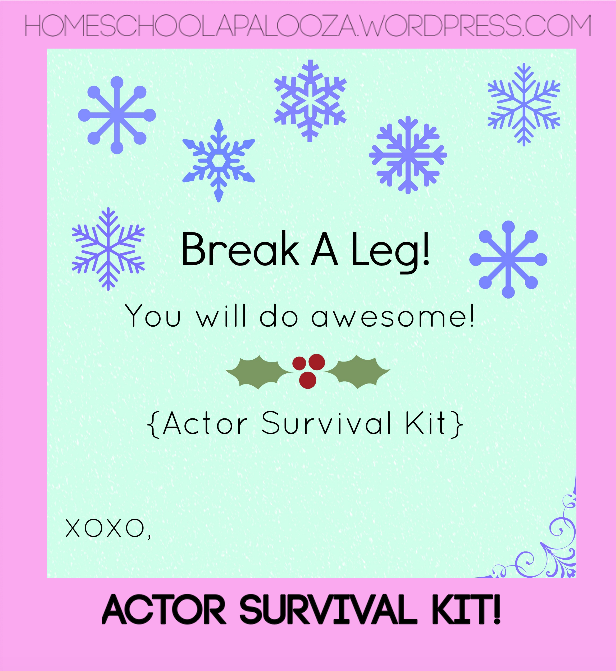 Today, I am going to show you how to make the Ultimate Actor Survival Kit! My BFF is in a musical, and her opening night is coming soon, so I wanted to make her something SUPER special, because as all actors know, getting those flowers and gifts on opening night is awesome!! As an actress, I was thinking of everything I love to put in my locker for backstage boredom, remedies for sore throats, and when I get home from a long night of rehearsal. 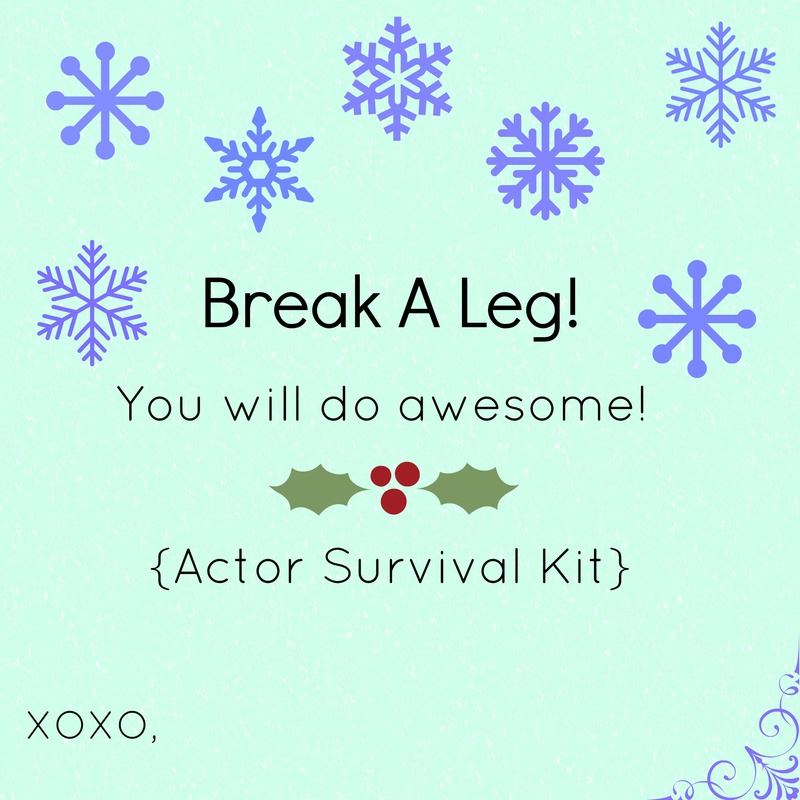 Here is everything you need to put together a Actor Survival Kit! First, print off this amazing label! Tea Packets – I can not stress how amazing tea is to soothe a throat after you have just been belting your heart out! Notepad – Everybody needs something to do backstage! Pen – so that you can doodle! Water – When you have mics on you can only drink water, so water is a necessity in a Actor Survival Kit! Sea Salt Scrub – Everybody wants a sea salt scrub after working hard on stage! Eye Pillow – For when you have to wait 2-3 hours till you get ready for the next show. Go to sleep! Put this all into a bag and you are ready to go! I added a bow to the top for a little extra Pa-Zaz! This is such an amazing gift and I am sure the person you give this to will love it! 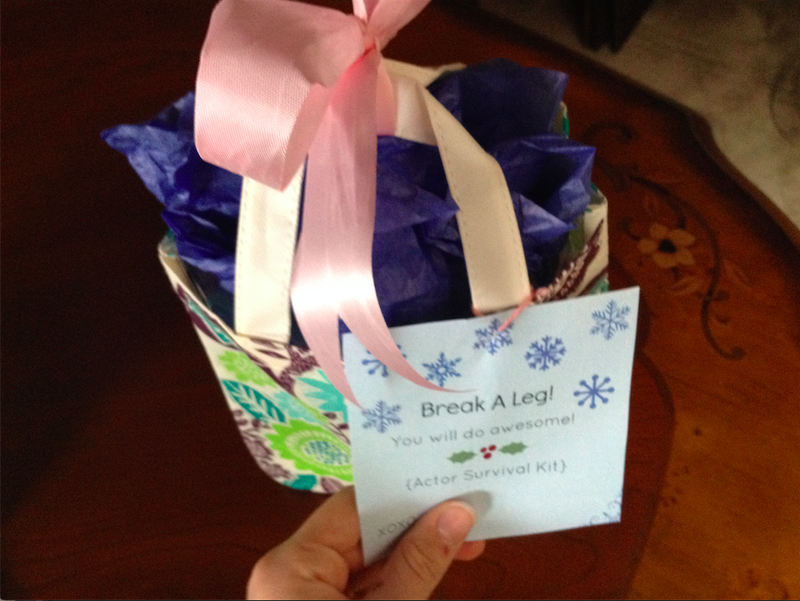 Liv if you are reading this – BREAK A LEG!! What an awesome idea! As a former Drama Clubber, I love it! How wonderful! I am a professional actor, and I direct and teach theater for kids, and these are great and considerate ideas! Aww thanks 🙂 She loved the gift and killed it on opening! Dank für die Kommentare! Google Translate ist nicht die beste zu mir zu sagen, genau das, was Sie gesagt haben – aber ich schätze Sie kommentieren!